One does not expect a political allegory to spring out of a movie about a trio of tomb raiders searching for a mystical artifact that could have the power to resurrect the dead. Such an allegory, though, does emerge from "Mojin: The Lost Legend," a movie with an outlook on history that is as questionable as its sense of adventure. Come for the murky action, and stay for the shudder-inducing feeling of nostalgia for Mao's Cultural Revolution. It's a very odd movie, indeed. The movie is set in 1989, as the three tomb raiders have retired to a "sick" America, specifically New York City. Hu BaYi (Chen Kun) and Wang KaiXuan (Huang Bo) have started selling Chinese "artifacts" on the street, promising culture and luck to any purchaser. A gang of INS agents chases them through an alley, but the pair is rescued by their fellow tomb raider Shirley (Shu Qi), who has taken to life in the United States, much to Wang's chagrin (at one point, he also derides her for being a feminist, and the movie itself seems conflicted about whether to treat Shirley as a strong character or a goal for Hu). Wang, who participated as a member of a Red Guard group with Hu, still thinks of himself as a revolutionary of sorts, and his longing for the old days—taking the fight to the bourgeoisie while quoting Mao from heart and clinging to his little red book—becomes the movie's. A key series of flashbacks to an archeological site in 1969, where members of the Red Guard group see the ancient statues as markers of bourgeois excess, offer us a love triangle featuring Hu, Wang and Ding SiTian (Angelababy), a fetching Communist who has stolen the hearts of both men with her status as a true believer. Her death during an expedition (within a Japanese military bunker in Inner Mongolia) to find the mythical Equinox Flower has haunted both men for different reasons. Hu lost a true love, and Wang lost a representation of the purity of the revolution. Hu has moved on to a certain degree (the opening "It was just a dream" sequence suggests he hasn't entirely), having slept with Shirley at one point before becoming uncertain of having a relationship with her. Wang, however, still holds Ding in his heart, and it has a lot more to do with his political leanings than whatever feelings he might have had about her. The point becomes clear: Times, attitudes and international economic relations have changed, leading China away from the country's supposed glory days. Now, it's up to these characters to reconcile the new way of things with their yearning for the past. It is unclear what this through line is doing in a movie that, at its heart, wants to be a rousing adventure through an ancient tomb filled with booby traps, rickety old bridges, towering rock formations, mazes, puzzles and an army of undead warriors. One can't help but feel the arm of propaganda reaching out through Zhang Jia Lu's screenplay (based on the novel "Ghost Blows Out the Light" by Tian Xia Ba Chang). The villains here are agents for a multinational mining corporation that doubles as a front for a religious cult led by the company's president (Liu Xiao Qing), who wants the Equinox Flower to save the world from an unspecified disaster. 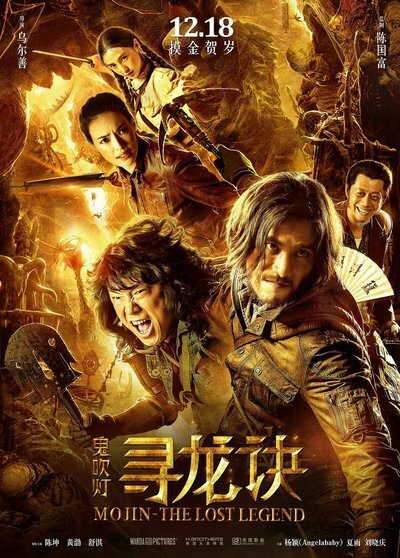 The company enlists Wang to find the tomb, located somewhere in Inner Mongolia, and he's joined by obnoxious comic relief in the form of Grill (Xia Yu), an antiques hustler who constantly whines and moans. Later, Hu and Shirley arrive to aid their comrade. The movie's adventure beats are familiar before becoming chaotic, and director Wuershan and cinematographer Jake Pollock don't do the sequences any favors with the movie's sickly blue-gray color palette. Scenes of potential tension, such as the group navigating a path of hanging bridges connecting pillars of stone, quickly turn to ones of much destruction, featuring unimpressive visual effects (aspect ratio shifts during these sequences let us know Wuershan prizes spectacle over coherence). A few fight scenes with zombies are equally frantic and unintelligible. By the climax, though, it has become clear that the movie's primary intentions rest with those flashbacks and what the story within them represents on a political level. "Mojin: The Lost Legend" is equal parts shabby and discomforting.